How do blood ties affect family enterprises? What makes for a good succession? How can the older generation pass their knowledge and passion to their children? 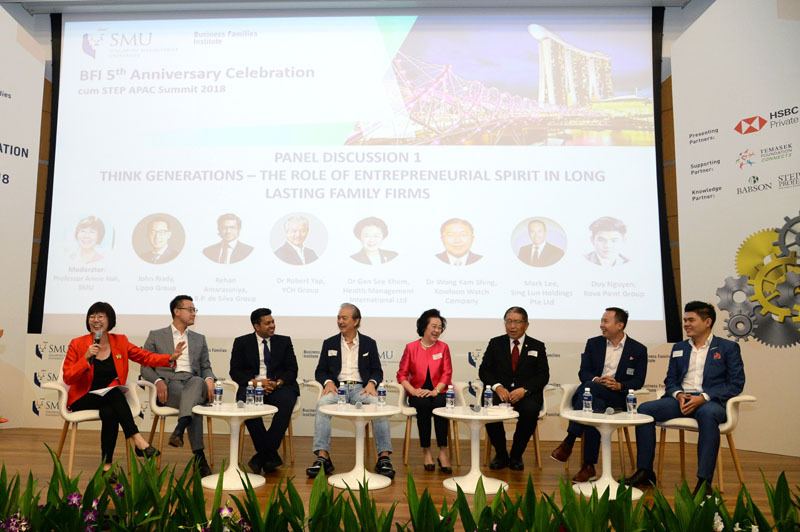 The pioneer institution dedicated to studying these questions in transgenerational leadership in business families in Asia, the Business Families Institute of Singapore Management University, has turned five. It celebrated its 5th anniversary over two days on 26 and 27 July. An engaging and collaborative programme kicked off with a masterclass on developing next-generation leaders of business families on Day 1, followed by a conference and the launch of a celebratory book at a gala dinner at the Fullerton Hotel in downtown Singapore on Day 2. Close to 30 academics and some 250 business owners and industry practitioners from 15 countries participated in the Successful Transgenerational Entrepreneurship Practices (STEP) Asia-Pacific (STEP APAC) Summit 2018. BFI is part of the STEP Project with Babson College, ranked No. 1 undergraduate school for entrepreneurship in the United States for the 21st consecutive time in 2017. 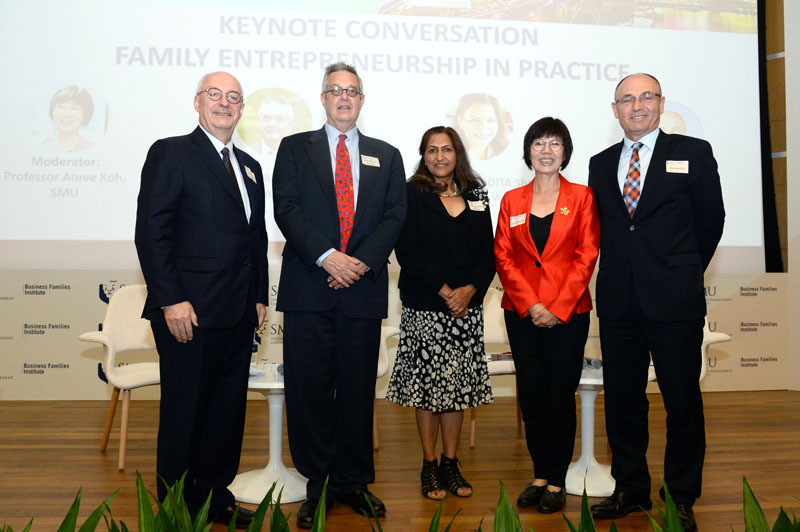 The STEP APAC SUMMIT 2018 programme on 27 July saw three keynote addresses by three highly-regarded speakers on family and social enterprise. 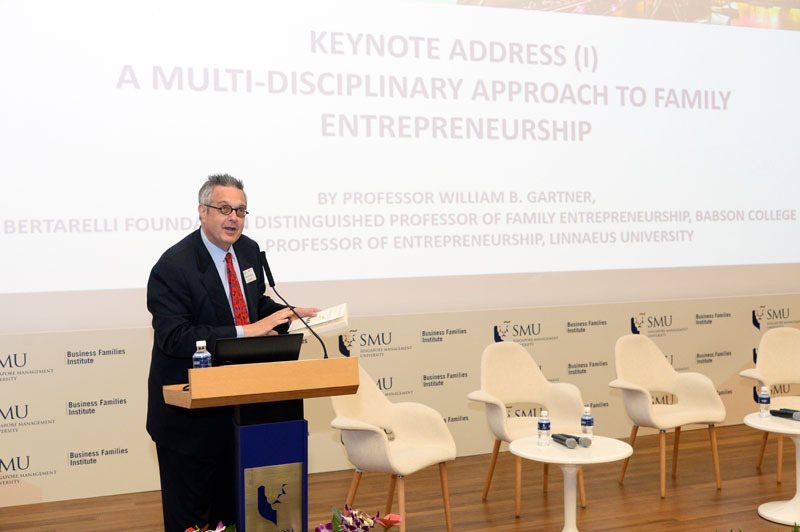 The first keynote address was by Professor William B. Gartner, Bertarelli Foundation Distinguished Professor of Family Entrepreneurship, Babson College. He is also Visiting Professor of Entrepreneurship, Linnaeus University. Entitled “A Multi-Disciplinary Approach to Family Entrepreneurship”, he noted that the narratives used to tell family stories in family businesses matter. Entrepreneurship is practised in the home and it is through this socialisation process in the family that entrepreneurs are nurtured. Entrepreneurial legacies are imprinted in children through active involvement in the family firm and through story telling within large and cohesive families. 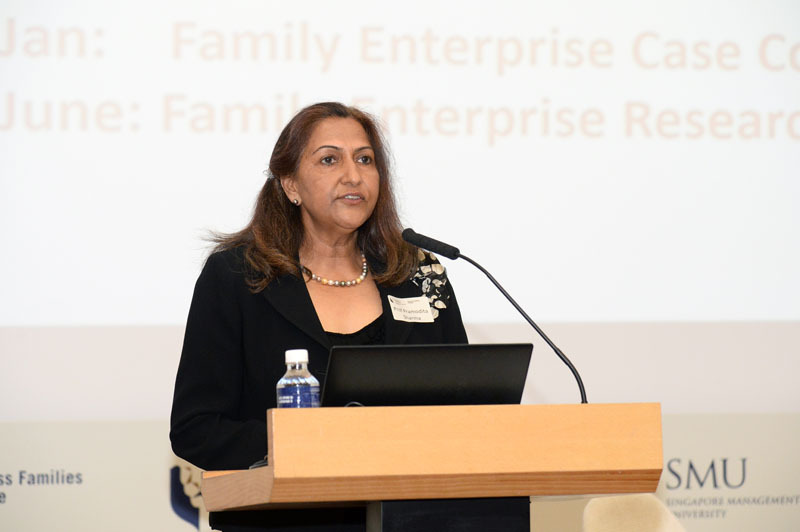 This ties in with the second keynote address was given by Professor Pramodita Sharma, the Daniel Clark Sanders Chair in Family Business, Grossman School of Business (GSB) at University of Vermont. She is also Visiting Professor, Kellogg School of Management’s Center for Family Enterprises at Northwestern University). Her keynote is entitled “Entrepreneurs in Every Generation: How Successful Families Develop Next Generation Leaders”, she said that there are 4Ps to the building of next-generation leaders. In the first, families should have a Purpose to energise the family enterprise. Secondly, the family should Plan for the continuity of both family and business. They should establish Policies long before they are needed so that they are not caught unawares in the event of adversity. The family should also devise a Process to use in resolving road-blocks in the family communication process. Finally, families should also recognise the emotional and problem-solving demands of the Parenting paradox – to control or to support? This was the substance of her masterclass given a day earlier. The third keynote address concerned Empowering Women Entrepreneurs. The speaker was Mdm Chetna, the Founder-Chairperson, Mann Deshi Bank and Mann Deshi Foundation. She was the Co-Chair, World Economic Forum in Davos in 2018. Ms Sinha, an economist, left an urban lifestyle to develop India’s first rural co-operative bank owned by women. The Mann Deshi Bank, a micro-enterprise development bank, provides low-income women with business loans to raise their earning capability and provide for their families. She also established a business school for rural women, training them in entrepreneurial skills despite their illiteracy. She also established a social impact fund dedicated to first-generation female entrepreneurs. Out of these efforts, one of the beneficiaries is Sarita Bhise, a teenage nomadic shepherd girl who used to run on a 5km commute between school and home. She is now training to play hockey at the 2020 Olympics in Tokyo. Participants also listened to three panel discussions focused on issues close to the heart of business families: the role of the entrepreneurial spirit in enduring family firms, how to transform the traditional family business to keep up with technological change and building purposeful businesses for philanthropy. The first panel discussion featured the following speakers: Duy Nguyen, Chief Executive Officer, KOVA Trading (KOVA Paint Group); Dr Gan See Khem, Executive Chairman and Managing Director, Health Management International Ltd; John Riady, Director, Lippo Group; Mark Lee, Chief Executive Officer, Sing Lun Holdings Pte Ltd; Rehan Amarasuriya, Executive Director, B.P. de Silva Group; Dr Robert Yap, Executive Chairman, YCH Group and Dr Wong Kam Shing, Director, Kowloon Watch Company. On the issue of how the entrepreneurial spirit is passed down the generations without eroding core family values, the question was how entrepreneurship was nurtured while allowing space for the new generation to grow into their leadership roles. As John Riady, a third-generation leader of the Lippo Group of Indonesia, said, the economic crises of 1998, 2000, 2008 and 2018 made the family more cohesive. He noted that his elders have given him the space to make mistakes and learn. He wants to give his own children the space to find their calling in life and to meet the unmet needs of society. During the second panel discussion, next-generation leaders discussed how transgenerational entrepreneurship takes place in their respective family businesses. The panellists were: Chirawan Diskul, Vice President, Siam Park City; Derrick Yap, Chief Executive Officer, PBA Group; Ho Ren Hua, Chief Executive Officer, Thai Wah Public Company Limited, Shahzada Dawood, Vice Chairman, Dawood Hercules Corporation Limited and Joanna Ho, Managing Director and Head of Wealth Planning, Asia-Pacific Private Wealth Solutions, HSBC Private Banking. The moderator was Professor Jean Lee, Professor of Management, Michelin Chair in Leadership and Human Resources Management, Department Chair (Organisational Behaviour and Human Resource Management), Co-Director, CEIBS Centre for Family Heritage, China Europe International Business School (CEIBS). The panelists, a group of young successors, discussed how to drive positive changes to transform the family business. Derrick spoke about how he transformed PBA by “killing” what was a profitable business in trading mechanical and automation products to make room for the creation of PBA’s own intellectual property in the design and production of high precision components. Derrick’s daring bet paid off and PBA has become a leading robotics player in the region. Ren Hua described how he made sure he asked senior managers at Thai Wah what the company meant to each of them on his first days as CEO. The answers of these senior staff became his values in steering the company. For Chirawan, working in the family firm meant she had to build her own credibility in front of her colleagues. “After I got my degree in England, I was very proud I could speak English and came back to my father’s company to join the marketing department,” she said. But no one gave her any work for a week, she recalled. “I took a walk around our park and realised that someone needed to take care of the toilets in our amusement parks. I made sure I did such a good job other departments also wanted me,” she told the amused audience. 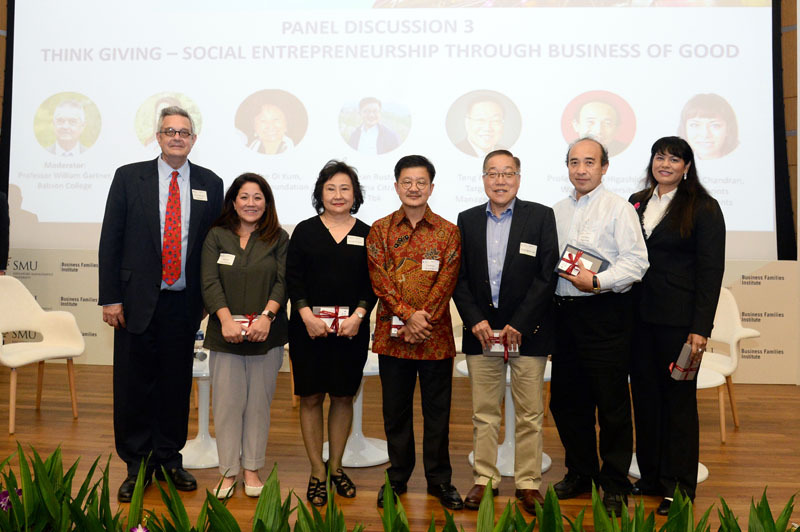 The final panel discussion was how to build purposeful businesses to benefit the community. 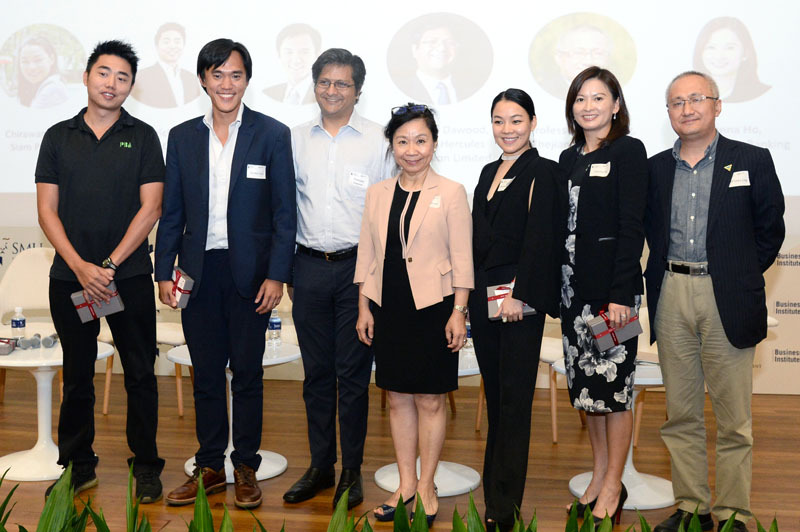 The panellists were: Dr Lee Oi Kum, Founder Member, Houde Foundation; Sharon Chandran, CEO, Footprints Investments; Tandean Rustandy, Chief Executive Officer, P.T Arwana Citramulia Tbk; Teng Ngiek Lian, Chief Executive Officer, Target Asset Management Pte Ltd, and Professor Hiro Higashide, Graduate School of Commerce, Waseda University. The moderator was Professor Bill Gartner. The focus of the discussion was the role that family businesses had in the community. 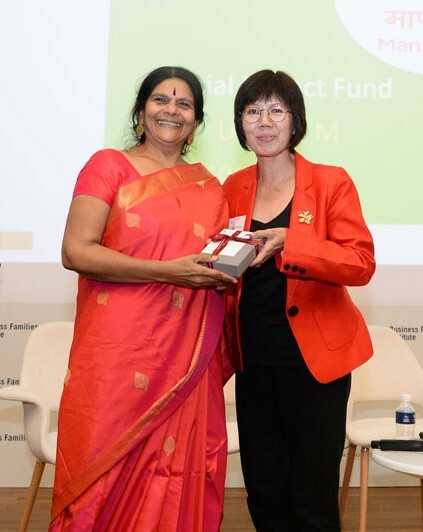 Apart from encouraging family members to be cognisant of the local workers such as plantation workers, said Dr Lee Oi Kum, it may be necessary to start measuring the impact of the use of CSR initiatives to enhance them as circumstances change on the ground. Last updated on 01 Aug 2018 . Like a love story straight out of a Korean drama, SMU alumnus Kenneth Tan (BSc Econs, 2009) and a...; 10 hours 31 min ago. Congratulations to the inaugural batch of professionals graduating with an Advanced Certificate i...; 16 hours 36 min ago.